IN a recent issue of our South American contemporary Aviation (Buenos Aires) there appeared a brief description of a small and somewhat novel amphibian "one-and-a-halfplane," the invention, it appears, ДальшеMore>>> of one Hermann Mayenberger. Unfortunately, details of the more interesting features are by no means complete, and the nationality of the machine is somewhat obscure. However, we give our readers what information is available, together with general arrangement drawings. This machine has been designed with the object of fulfilling the requirements of the sportsman, the farmer, or commercial man who wishes to be independent of the railway or other means of communication. Simplicity of construction has been a main consideration, without, however, causing any sacrifice to aerodynamical requirements, strength, etc. 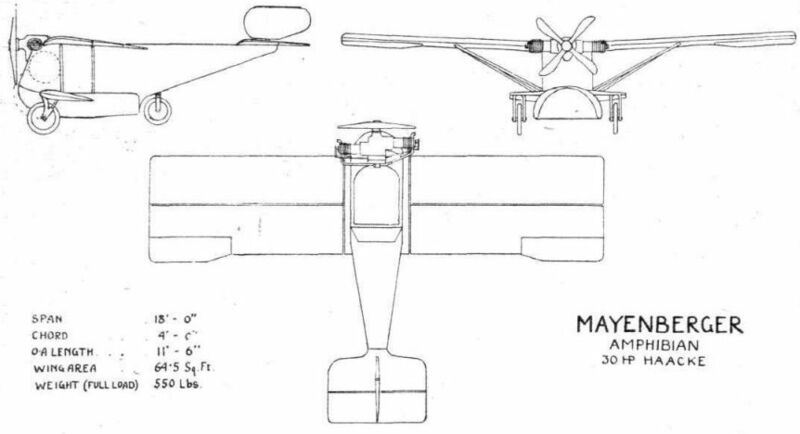 As may be seen from the accompanying drawings, the body consists of a short rectangular-section fuselage, tapering abruptly towards the rear, and very deep in front, where the lower portion is formed into a hydro plane or float. Projecting from the sides of the latter are two short stumps of wings which carry the main landing wheels. These, it would seem, are hinged at the top extremities of thin struts or forks so as to fold upwards, out of the water, beneath the main plane. At the rear of the float, below the fuselage, is a third wheel, which is connected to the control operating the rudder, and thus serves to steer the machine when on the ground. The main planes, which are set at a slight dihedral angle, are attached to short wing-roots mounted on the top longerons of the fuselage, and their incidence - 5 deg flying horizontal - is such as to allow a low landing speed. It will be observed that each wing is divided into two sections, transversely, the object of which is, apparently, to allow the trailing portion to hinge down, when the front portion then folds back - thus occupying the minimum of space when folded. They are braced by a pair of struts each side, extending from the bottom of the fuselage up to the wings. No other bracing; it is claimed, is necessary: As to how the folding of the wings, and raising wheels, is achieved is not stated, but the mechanism for folding the wings is contained within the latter. The tail planes consist of a lifting stabilising surface - to the trailing edge of which is hinged a one-piece elevator - mounted on the top of the fuselage. Above, is an oval-shaped balanced rudder, but no vertical fin. The control of the machine is somewhat novel, and all controls are concentrated round the main control wheel - all, both for engine and machine, being operated by hand, and no pedals of foot bar are employed. It is claimed that the control of the machine is thus extremely simple. All control cables and rods are placed out of the way and within the fuselage. Unbalanced ailerons are mounted at the rear extremities of the main planes. The pilot's cockpit is large and roomy, being situated in the deepest portion of the fuselage, in the centre of the wings. Immediately behind the pilot's cockpit is a compartment containing a parachute apparatus, consisting of two parachutes, superimposed, attached to the pilot's seat, and capable of supporting the weight of the machine, thus allowing it to glide safely to earth in case of emergency - at least, so it is claimed! The parachutes are released by means of an automatic button, situated on the control wheel, and are shot out of the compartment - whichever part of the machine they are stowed - by means of elastic, unfolding at the same moment. The engine, a 2-cyl. 30 ih.p. Haake, is mounted in the nose of the fuselage, and drives a four-bladed tractor screw, 3 ft. diameter, covered with a thin covering of metal for protection against water, spray, etc. It is claimed that this little amphibian can, when its wings have been folded back, be driven along ordinary roads - like an automobile - with ease and safety. This appears to be a reasonable claim, inasmuch as the third wheel, at the rear, being connected to the rudder control, should render steering an easy matter, whilst the small diameter of the tractor screw allows the latter to be employed as a means of propulsion with comparative safety. It is also stated that the machine can be stored in any ordinary garage, etc., owing to its small overall dimensions with the wings folded. Span 18 ft. 0 ms.
Chord 4 ft. 0 ins. Overall length 11 ft. 6 ins. Overall height (over tractor screw) 5 ft. 0 ins. Area of wings 64-5 sq. ft. Weight of machine empty 297 lbs. Weight of machine with full load 550 lbs.